This entry was posted on February 7, 2019 by Jessica Anderson. 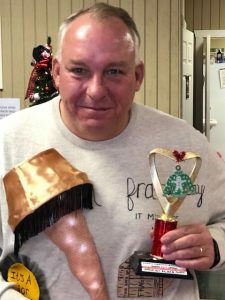 After much debate at our Trophies2Go Christmas Party, our staff decided to award our 2018 Product of the Year to our Ugly Sweater Trophies! GMC Ugly Sweater Winner! Christmas Story Sweater! These creative Christmas trophies were created in fall 2017, a brainchild of our designer and laser engraver, Lori N. Lori used some figures that we never sold, spray painted them gold, laser cut wood into the shape of a sweater, and with blood, sweat and tears and lots of glitter paint, created the masterpiece we sell today! Every ugly sweater trophy is hand-crafted and painted lovingly by Lori. 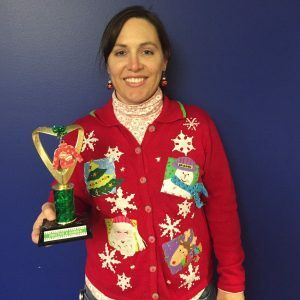 "I spent a long time looking at the different (ugly sweater) trophies, and this one by far was the best." "It was an absolute hit! We love it!" 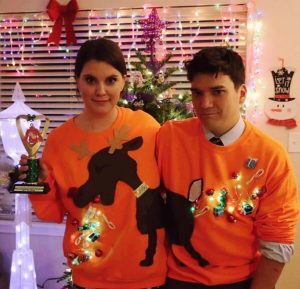 Customers also sent me some pictures of their Ugly Sweater winners with their First Place Ugly Sweater Trophies. I'm posting a few here for you to enjoy! 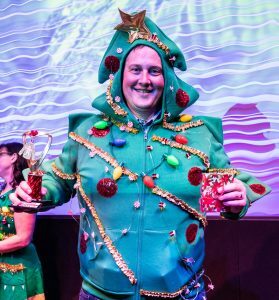 Our best-selling Christmas Trophies of all time, our Ugly Sweater Trophies will be the hit of your next Holiday Party...10 months from now!